Today I spent my lunch hour knoshing on rabbit food and trudging through cyberspace in search of the wild and woolly side of aviation. On most days, the news jumps out and screams to be seen, and other days – like today – there just wasn't any really hard news worth posting about. So I went over to The Google and performed a search for "weird aircraft" just to see what is out there. Not sure why, I just did. Well, I am happy to report that just like anything on The Internets, someone named Mark Fisher has compiled the definitive collection of off the wall and weird flying machines. Convair YF2Y-1 Sea Dart: OK, amphibian jets are unusual, yes, but a fighter?!? With retractable skis, the Sea Dart was underpowered and shook like crazy. After being re-engined, this aircraft holds the distinction of being the only amphibian to go supersonic! What crazy idiot did that?!? 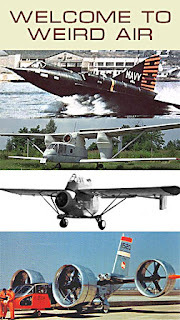 Bell X-22: Helicopters are weird enough, and trying to combine their vertical flight capabilities with fixed wing performance often leads to some bizarre designs. The X-22 had four General Electric T58 turbojets mounted mid-cord in the rear wing, which, through a complex system of shafts, drove four standard Hamilton props in tiltable ducts. After a "hard landing" due to a malfunction, it was deemed uneconomical to repair. Go figure. P.Z.L. Mielec M-15 Belphegor: The only biplane (sesquiplane, actually) powered by turbojet I know of, its large, mid-wing tanks are for agricultural work. Pilots refused to fly the prototype because of safety concerns. Duh. Transavia PL-12 Airtruk/Skyfarmer: Yet another agricultural bird, this sesquiplane-winged twin boom single seater has a fuselage that looks like a broken Dorito chip. The radial engined version looks even worse!